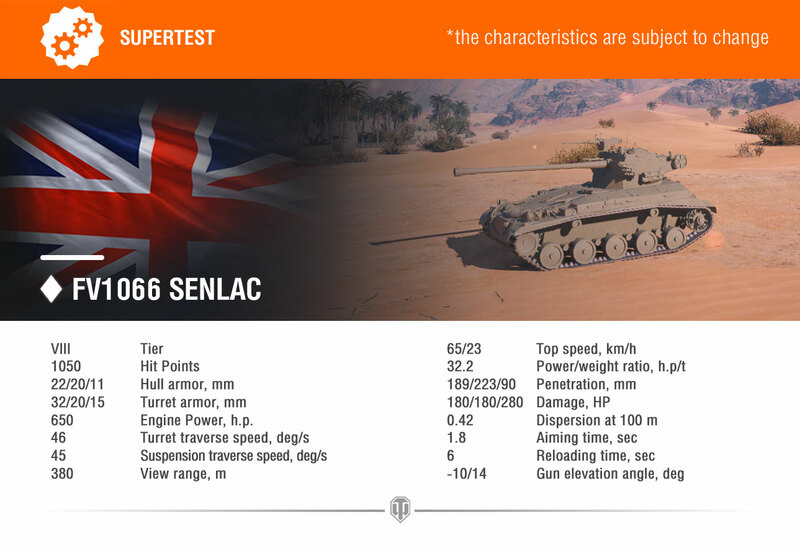 Today marks the start of the Supertest for a new Premium British Tier VIII light tank: the Senlac. The Senlac’s gun has good armor penetration (189 mm with a basic round), small aiming time (1.8 seconds), and decent stabilization. Still, this tank cannot excel as a sniper because of low accuracy (the dispersion is 0.42 m at 100 meters’ distance). The Senlac’s HE shells deal 280 points of damage. They have 90 mm of armor penetration, making the Brit a real scourge of enemy vehicles with thin armor. The HE shells fired by the Senlac travel at the same speed as basic rounds (1020 meters per second) which means they are way faster than HE shells of other tanks. Gameplay-wise, the Senlac is much like the HWK 30. At the beginning of a battle, you can act as an effective active spotter (provided that even faster vehicles aren’t present in your team). By the battle’s end (with enemy light tanks already back in their Garages) you can get more aggressive. The Senlac has a crew of three. Please take note that the vehicle’s stats aren’t yet final and may change depending on the test results. Follow the news and good luck in your battles! So another marathon tank when the british LT techtree is added later this year? Doesn't look very interesting though: Rather low alpha, no armor, bad accuracy, mediocre mobility, mediocre DPM and bad viewrange. LT-432, HWK and probably even both M41s will eat it for breakfast. I kinda want to try it out ..
Is it going to be another Marathon vehicle? 1066? You like to rub it in don't you? Base dpm seems bit low and accuracy also. At first clance model seems really small so lot is up to it (size and gamo). But fast HE-Shell helps quite a lot. Definetly not OP as LT-432. So with these stats gamo and vehicle size should be really small. Size should be second smallest tier 8 light (elc even 90 smallest). So are the new British lights going to be following the FV CVR(T) series of tanks? that would be great with a good choice of guns from 76 mm L23A1 low velocity HESH or HE or Mk3 M-A1 90mm, a variety of high AP autocannons or even the very experimental 125mm. The FV CVR(T) FV101 Scorpion would be nice with the still record holding 82 kph off road top speed for a production tank. the FV107 Scimitar would be epic with 90 rpm in 3 round bursts from the 30 mm L21 RADEN Cannon. Kinda a big fan of the British tracked combat reconnaissance vehicles. Only thing im not sure on is why the poor accuracy in the test of the FV1066? As far as I know from accounts of British CVR tanks in combat after WW2 their gun accuracy is amongst the best in the world as it was one of the primary stipulations amongst their design, cant have tanks close supporting troops which was a major role of a lot of the FV CVRs if you cant be 100% sure where you shots will land. So Chieftain Mk6 will be added to the tech tree line Q2 of 2020?  Edited by undutchable80, 13 April 2019 - 03:14 PM. I know some years ago they got access to the Bovington archives but the name seems highly unlikely. FV1966 maybe. British lights tree at last? Tracked or wheeled? Even though they are rear turreted (which I'm not fond of playing), I have a soft spot for the Scorpion. I remember opening a big box one Christmas many many years ago, and finding the Action Man version of the Scorpion inside. Happy memories. That damage and penetration make no sense on a 20pdr. In agreement, although the Scimitar had the capacity to load 2x 3 round clips and fire ALL 6 automatically (autofire) and this quite quickly, if I recall seeing them live firing accurately in was within 6 seconds with almost no inter-shell reload. Now that would be something interesting to play, since the shells had a decent (almost) 1200m/s velocity too. Imagine if WG introduced a 'counter' to the wheeled vehicles that had a better view range and a HE derp gun to blast them back into the garage.. Lols.. (dreaming)..
Nice it's unique but not going to be worth it under gold ammo nerf. Would like to see some more about this from WG....is there ANY historical basis? It looks to me like the UK went to war with Sweden sometime and captured one of their tank designs. Meanwhile I can't see any logic at all to the awful dispersion. Looks pretty awful to be honest, its straight up worse than the HWK 30 in almost every way, slower, less agile, worse view range by a lot, worse alpha, worse HE alpha, worse accuracy, pen difference is minimal. Even the claimed 'good penetration' is rubbish, the M41D has 192mm on 76mm, and you give this 20lber 189mm of pen which is meh and the odd 180 alpha, but with crippling low DPM for that alpha, its got the same DPM as a Defender! Hope this is not a sign of what the British lights are going to be because based on this they are looking like WORSE German lights, which we all know is the worst light line in the game right now. Needs buff to be even half worthwhile IMO, speed buff to like 70kph, DPM buff to at least over 2k, accuracy buff to something usable, and maybe a penetration buff so it actually does have the best pen, like maybe give it 200 or something. Seems to have bad gamo values and rather big size, so currently UP as tajj7 stated.